Forum Index > Off-topic Talk > Visors: Methods of keeping them up or down. Posted: Wed 18 Jul, 2007 6:58 am Post subject: Visors: Methods of keeping them up or down. In another topic the way a visor ended up completely back made me wonder about how useful this might be ? The answer was that it was accidental and not comfortable, so this made me wonder about the usual way visors would be designed to stay up or down and not keep falling at unwanted times. My Mercenary Taylor's articulated neck Sallet does have a locking pin that keeps the visor in the down position securely but nothing to keep it open securely, although it is lighter than the Bascinet's visor and would stay in the up position more positively I think. ( Edited: Actually just checked and it does stay up fairly well ). So with historical helms where catches common or rare as far as we know from surviving examples ? Posted: Wed 18 Jul, 2007 10:01 am Post subject: Re: Visors: Methods of keeping them up or down. My Mercenary Taylor's articulated neck Sallet does have a locking pin that keeps the visor in the down position securely but nothing to keep it open securely, although it is lighter than the Bascinet's visor and would stay in the up position more positively I think. There is absolutely no evidence for any kind of a catch on any visor prior to the 15th century. After that they start showing up pretty regularly, and you even start seeing little "arms" designed to hold the visor in the raised position. Do you have any pics of those 'arms'? If i'm not mistaken (and i probably am, this is all based on a conversation down the pub after training) English Knights removed their visors when fighting on foot. When I don't want my visor down on my bascinet I either remove it or tie it back with the retaining straps ment to hold it closed. The last one is preforable to removeing it because I have noticed that the raised visor also keeps the sun out of my eyes . I think we get a skewed modern view on how armor works because we buy cheap armor from low or middle skilled armor reproduction companies. One of the armored men in Grey's camp has a McPherson sallet; the visor stays up when you lift it all on its own because he made the helmet correctly. Martin, my study of armored combat, including texts and practical experimentation, has lead me to conclude that almost all knights took off their visors to fight on foot. Typically, it seems that in friendly deeds of arms, where pinpoint precision isn't necessary, you leave the visor on for safety unless you want to act all macho (e.g., some of the deeds of Jacques de Lalaing). In serious deeds, however, what we might call "Kampffechten", the reverse is true because you need to be able to see very small targets and you have to be able to see incoming attacks from various odd angles. Robert MacPherson and I did a series of experiments in his shop with three different helmets, a bascinet with a houndskull visor, an armet and a sallet, using historically-correct fighting techniques from the Fechtbücher. These experiments made it pretty clear that you just can't see the targets you need to hit or many of the incoming blows you need to defend against when wearing an accurate visor. Exactly! People often think I go to far in insisting on accurate armor, but these are the kinds of things that make that necessary. I'll tell you, however, that there can still be confusion even when things are done accurately. Take, for example, German-style klapvisors (which, for those who dont' know, are fixed to the helmet with a single small hinge). No matter how tight you peen the rivet in the hinge when you ride a horse they tend to flop up and down, making it almost impossible to see to aim your lance. I've talked to Mac about this a lot and he's just not sure how they solved the problem since there's no evidence whatsoever for any other method of securing them in place. Except that there's no evidence for such retaining straps on historical helmets. Yes, here's a picture from an armet. This is from Blair, p. 227. Thanks for the replies so far and I should say that my Bascinet is from Valentine armoury and the visor is easily removable by pulling out the hinge pins. The whole visor being easy to open I think is mostly to get some needed air after heavy exertion or the need for a quick unobstructed peek around for situational awareness. That it stays up securely may not be that important for these quick peeks if longbow arrows were flying around in great numbers. Taking off the visor for fighting on foot seems to make a lot of sense but keeping the visor down might be advised if charging English long bow archers on foot and raising the visor when at spitting distance for the actual fighting, at that time it would be good for it to stay up. Well, a small heater shield could protect the face if the visor was taken off for foot combat ? Good design and execution should keep visors up without catches or lock except during very violent and sudden hard landings/jumps ? Maybe ? Oh, and I am not saying that catches were used or should have been used: Just asking questions to learn more. At Agincourt the French men at arms had to cover almost a mile of muddy terrain with their visors down or die before they got there; that explains why many of them died from the heat (and even if they didn't die or fall over from the heat, it still had to impair their fighting effectiveness). It also means they couldn't easily just rip off their visors when they got to the English line; that's tough to do when you're engaged even with side-hinged visors with pins on chains (remember, they'd been forced into a fairly deep column and the ones in the back were still being pelted with arrows). Some probably did remove their visors, but I'll bet most did not. Thus, the English could stand ready to fight with their visors off, but the French had to "fight" their own gear (visors) while trying to fight the English. Bloody brilliant. I have this image of Frenchmen fighting with their visors pushed up and English men at arms knocking them down with their spears so the French couldn't see to attack or defend themselves. A lot of wounds reported for surviving foot soldiers of the Hundred Years War were on the face and lower body. So armour must have offered fair protection to the trunk and crown of the skull, but not elsewhere. Foot soldiers wouldn't have necessarily had visors. The future Henry V took an arrow to the face during the Welsh Wars. I think there's at least a little validity to Hugh's point (if not a lot). Unbarded horses could be maimed, killed, or just driven wild by arrows. Men at arms would likely have hunched over to protect their faces or would have worn visors, either of which could cause the warrior to be extra weary/out of breath at the end of a good slogging through the mud or up a hill, etc. Hugh, great post and a very credible account of tactics and usefulness of archery. Sort of like small arms fire forcing a tank commander to fight locked down with much reduced situational awareness. Knocking down someone's lifted visor seems like a devilishly effective way to semi-blind one's opponent. Oh, and removing the visor would seem to be something one would need help with and something one would do in preparation to fighting on foot and not after a mile of slogging through mud. ( As you said in other words ). un-visored Bascinet that would have been worn underneath. ( Before the Bascinet visor became common or as an option by removing the visor ). Can you supply evidence for the claim that a lot of arrow wounds were struck in the lower body during the HYW? The huge preponderance of evidence I've built up over the last 15 years I've been actively researching this suggests almost no wounds to the lower body from arrows against a mass of troops. Most of the time when arrows did strike they wounded the face, hands, neck (where only mail covers the target) or insides of the elbows. Lower leg targets are usually protected by the mass of your fellows, leaving only the relatively few on the outside of a formation vulnerable. Moreover, while limb armor was lighter than that of other areas, it was also more sharply curved and in more rapid motion making it much harder to hit square (a physicist would say "normal") to the surface. Thus, limb armor achieved the same or more resistance to arrows in spite of thinner protection thank to the geometry of their construction. Incientally, I believe you're confused about the concept of "foot soldiers". The foot soldiers of the HYW were principally men at arms (except for support troops such as the Genoese crossbowmen at Crecy). the idea of poorly-armored conscript toops on the fields of the HYW is largely a Hollywood thing. Certainly the French brought them, but they were largely used as laborers. They certainly weren't front-line troops. Which suggests he had his visor up or off. I think there's a huge amount of validity in that. This, along with other factors I hinted at but didn't want to go into for fear of derailing the thread, go a long way to explain why archery was so useful and so effective when primary-source accounts and the best modern experimentation (e.g., that done by those with no vested interest in "proving" the efficay of arrows) show that arrows had little effect on most of the troops in the field. The earlier version of this would have been the removal of the Great Helm and fighting with the coif/cervelière or the un-visored Bascinet that would have been worn underneath. ( Before the Bascinet visor became common or as an option by removing the visor ). It's ironic but the Helm and crevellier combination often makes for better vision and breathing than a visored bascinet. This is because the breaths on a helm are flat in relation to your face and therefore allow you to see out through them (assuming you have a fair number of breaths, of course; some helms didn't) and because the lower edge of the helm sits farther away from my face so air gets in better. I fight in both a visored bascinet and in a Pembridge-style helm and the latter is *much* easier to see and breathe in. Very interesting how sometimes the older technology has advantages over the " convenience " of later technology. Great Helms seem to still have been used after visors became " popular " with the Bascinet maybe for the reasons you mentioned. 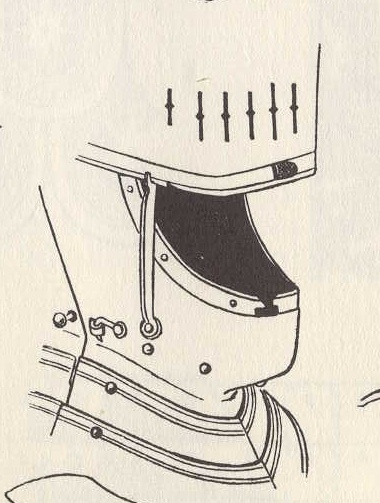 A Bascinet without a visor is just a more pointy Cerveliére using an avantaille rather than a maille coif over or under the cervelière as far as coverage is concerned: The area of exposed face being similar with the geometry of the taller Bascinet being superior at deflecting blows. ( Speculations not statement of fact by me ). For some reason the Bascinet with visor eventually replaces the Great Helm at least on the battlefield and still being used for joust ? Reasons ? Fashion, convenience, other(s) ? Yeah I don't think that it is historical either and interestingly enough I don't need them to keep the visor down as friction of the visor against the skull will do and adequate job of that on its own. They are instead put in for SCA requirements I think (I don't participate in the SCA) and so I just take advantage of their presence. Can you supply evidence for the claim that a lot of arrow wounds were struck in the lower body during the HYW? The huge preponderance of evidence I've built up over the last 15 years I've been actively researching this suggests almost no wounds to the lower body from arrows against a mass of troops. I was talking wounds in general, not just arrow wounds. My point was that armour protected most people in the trunk and upper limbs, and crown of the head. Faces were not necessarily covered and not everyone had leg armour. Yes, I was unclear. I was referring to soldiers and archers not fully armoured. Exactly my point. We're not in disagreement. Again, we're not in disagreement. I'm trying to support your claim.